If Bill Gates says it's one of the most important books he's ever read, I think it's at least worth my time to read it. In fact, he even says that for someone who is scrupulous with how he spends his time, he found the 800+ pages of this book still well worth it. Here are the books that Bill Gates has read - some with his reviews, some without http://www.thegatesnotes.com/Books. In fact, this section on his blog was one of the biggest reasons I have this bookshelf section on my website, since I believe the things a person reads tells much about the person. The books he reads mostly revolve around philanthropy and how to solve poverty, but don't despair. He's also read the Hunger Games. I guess he is human after all. The main tenet of the book is to prove that violence has decreased over the course of history, rather than increase. This may be against our intuition, as memories of recent (and some on-going) wars and atrocities quickly fill our minds. 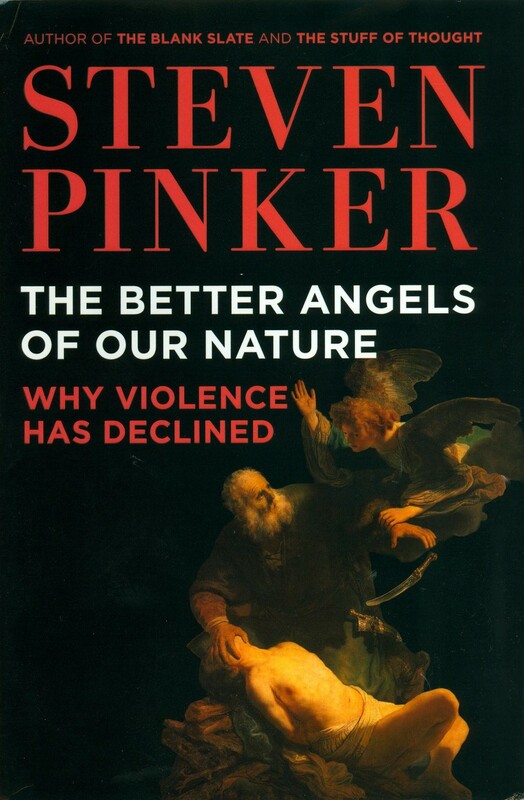 But Pinker uses a barrage of statistics and peer-reviewed studies to prove his point that the rate of violence per capita has in fact decreased. There are so many notes and citations it got to a point where I was amazed at just how many books and articles he read in order to pull this book together. The most interesting bits of this book for me revolve around the aspects of society that make the biggest dent in the reduction of violence. What really helped me tie everything together is a well-known concept called the Prisoner's Dilemma. In game theory, a Nash Equilibrium analysis would suggest that in a Prisoner's Dilemma, both players end up choosing a less-than-optimal solution. Pinker modifies the name to "Pacifist's Dilemma" and uses it to explain a similar occurrence in violence and aggression. To imagine the Pacifist's Dilemma version of this, think of two tribes. If they both cooperate and trade goods, they both get +5. If one attacks the other, the winner gets +10 and the loser gets -100. When they both attack each other, they both end up at -50, since it is better to endure the punishment of war than let the opponent defeat you (a score of -100). You can see how the incentive structures would promote tribes to declare war on each other and end up worse off than if they both chose peace. So what exogenous factors led to the decrease in violence, and how can this Pacifist's Dilemma be resolved? The first way is a fair and competent government. A government is essentially a disinterested third-party that holds a monopoly on violence. The reason that is important is because without a government, people resort to revenge. If A killed B, B's family and friends will want to kill A. And then A's family and friends will want to do the same to B's family and friends, and so on a so forth in a vicious downward spiral. When there's a government doling out the punishment, B's family saves face because the perpetrator has been punished and they don't need to exact revenge. A's family and friends have no reason to retaliate because the punishment was not personal - it was done by a disinterested third party. Specifically, for the individual, it raises the cost of an attack, so that instead of +10, -100, it becomes +10 -10 -100, with the extra -10 being a fair punishment doled out by the government. This tilts the equilibrium towards peace. Another major factor that stuck out to me was commerce. Quite simply, it makes your opponent more valuable alive rather than dead. If commerce is enhanced, then the payoff of peace becomes more than just +5. Perhaps it becomes +15 or +20. In that case, we'd rather "make money, not war". One last one that stuck out for me was the popularity of books after the advent of the printing press and the Humanitarian Revolution of the 18th century. Before this, people found it hard to see things from the other person's perspective. But once literature and the arts was able to bring you into the eyes and soul of another human being, you began to feel what they felt, and you suffered when they suffered. This phenomena now known as empathy reduces the payoff of violence because the violence you inflict on the other is also inflicted on yourself in the form of regret and mental anguish. An original payoff of +10 might decrease by 5 or 10 and make war a less desirable choice than peace. This book has a very rational and analytical view of history, and is less about love and faith curing the world's problems than it is about hard human incentives and how they drive our behaviour. Well worth your time indeed.